I have a line of mumps code that creates a folder on a network shared drive. If I run this line of code from a cache terminal window it works fine and creates the folder without problems. However If I create a very simple business operation in a production in the same namespace that simply runs this one line of code then the code fails. Anybody encountered this issue in the past and If so how did you overcome the problem. Google'd it a bit and someone suggested it might be how my username is assigned to the business operation. If this is the case then how is that done? It sounds like you're running on Windows? Check Task Manager to see what user your "cache.exe" processes are running as. This user needs to have the appropriate permissions for \\share\folder\. Answers to the following questions may be helpful. What Caché version are you running? What operating system is Caché running on? What operating system is the shared drive? If you are running on Windows I'll recommend you to take a look that the service of Ensemble has a domain user configured. Usually this user it's a local administrator on the machine. If there is, take a look if this user has the appropriate permission for \\share\folder\. Thanks everybody for the help. 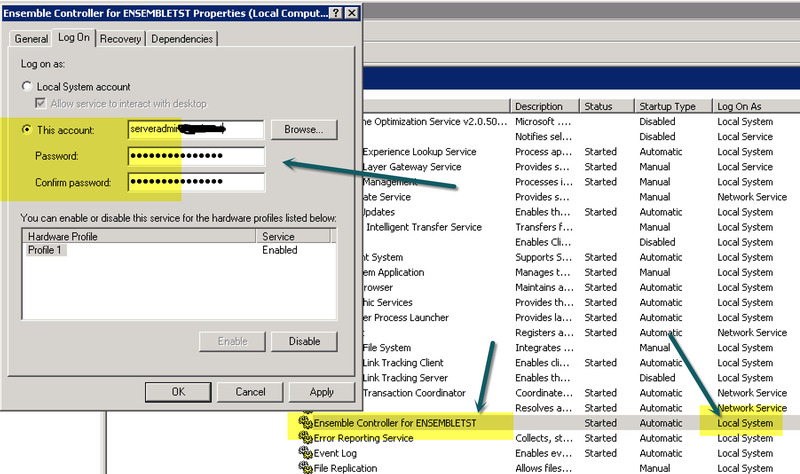 The ensemble service was running as "local system" in windows services. Changing it to run as our server account sorted the problem out.